Kinkell House Hotel is a Four Star Hotel which is open all year round and where you will be assured of a warm and hospitable reception. Kinkell House Hotel is a small Country House peacefully situated in its own grounds surrounded by trees and pasture land. The charming 150 year old converted farm house is located on the Black Isle in Ross-shire sitting above the Cromarty Firth, with spectacular views across the firth to Ben Wyvis and the mountains to the west Coast of Scotland. 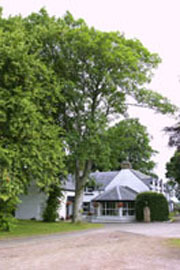 Kinkell House Hotel is ideally situated two and a half hours from John O'Groats, one hour from Ullapool and the Western Isles, two and a half hours from Portree on the Isle of Skye and half an hour from the infamous Loch Ness. The general area is steeped in history, including, Culloden Moor in Inverness, the Standing Stones on Lewis and the magnificent Dunrobin Castle near Golspie, to name but a few. The house is traditionally furnished and offers good food and wine, and great comfort in a relaxed and informal atmosphere. The Hotel Restaurant with its beautiful views, and in the evening captures the setting sun, welcomes non-residents. We operate a Table d’hote menu which changes daily, along with an A la carte menu based on traditional Scottish and Seafood dishes. Our kitchen serves the finest locally sourced fresh Scottish produce and is served in a warm and friendly atmosphere in our charming dining room with views to die for. See our sample menu opposite. Lunches are served daily in our lounges, conservatory or dining room, depending on your choice of fare. The extensive range of wines, from Inverarity Vaults, will caress you gently through your meal and our selection of fine Highland Single Malts, will send you to bed with a warm and satisfying glow. We have two lounges and a conservatory for the use of guests and residents alike. The conservatory is comfortably furnished with cane furniture, whilst the two lounges have coal and wood burning fires, wonderfully cosy on a cold winter’s night sitting in an armchair with a coffee, a book, or a “wee” dram. 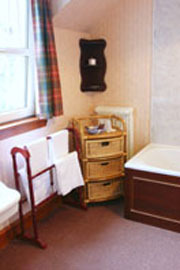 There are many varied pursuits to follow such as, hill walking, fishing (sea, loch and river), clay pigeon shooting, abseiling, canoeing, off road 4 by 4 driving, go cart racing, numerous golf courses (championship and otherwise), stalking, shooting etc., and not forgetting the magnificent scenery and beaches should our wonderful Scottish weather permit.